In January, Ward Waste Products Ltd. collected the keys to the first Next Generation Scania (R520 Highline) to be sold by T Nolan & Sons. To mark the acquisition of this stunning new vehicle, we revisited the company’s picturesque location in the West Limerick village of Tournafulla and touched base with Johnie Ward to get an update on this exceptional operation, which specialises in fallen stock and waste collection. For more than half a century –since the late Peter Ward Snr. 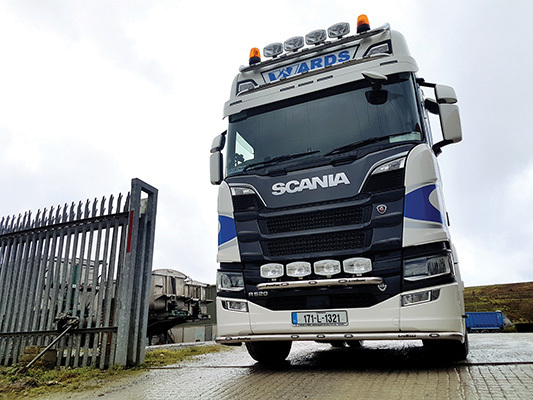 purchased his first truck and began collecting dead animals from local farmers –Ward Waste Products Ltd. has been providing customers with exceptional haulage solutions. The quality of the service provided has seen the company not only survive the test of time but go from strength to strength as the decades passed. 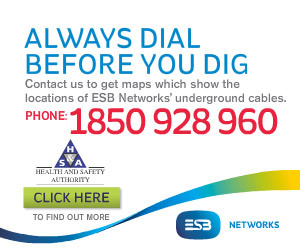 Today, the outstanding family-run business operates all over Munster under the Department of Agriculture’s Fallen Animals Scheme as well as offering a range of other waste and recycling services nationwide, generating gainful employment for a crew of 40 people from the area –an immeasurable boost to the local rural community. In order for any haulage operation to thrive for so long, investment is required and Wards have never been reluctant to spend money on personnel or equipment if it means guaranteeing customers higher service levels. To this end, they achieved a notable first at the start of the year when purchasing the very first 171-reg Next Generation Scania to be sold by T Nolan & Sons in Castleisland, County Kerry. The result of ten years of research and development and investment of more than €2b, Scania’s Next Generation reflects a strong focus on customer profitability through precisely customised transportation solutions in the form of sustainable products and services. The striking new truck delivers 5% lower fuel consumption thanks to further-developed powertrains and advanced aerodynamic solutions and represents the very latest advances in automotive technology for heavy-duty trucks. “We put the order in in October / November and we are delighted with the new truck,”notes Johnie Ward, who runs the business alongside his brother Peter Jnr. In 1988, we bought the first 3-Series Scania to come into the country from Delaneys in Naas; in ’96, when the new 4-Series came out, we got the first one to be sold by Nolans. ”The spectacular new unit takes its place in an immaculately-maintained fleet of 27 vehicles. “Keeping equipment on the road these days is very costly but we try to add something new every year,”Johnie notes. “At the moment, the fleet is about 80% Scania / 20% Volvo. In 2015, we purchased a new Scania for collecting fallen stock and last year we acquired ten high-quality second-hand trailers. You keep adding to it and tipping away. To complement the trucks, Ward Waste Products also run 35 bulk tippers, six walking floors, six tankers, two flat trailers and a curtainsider. All the gear is maintained, repaired and serviced in-house, in a modern workshop manned by four experienced commercial vehicle mechanics. “Our main work is anything to do with animal waste,”Johnie states. “Collecting fallen stock is the biggest one and we also do a lot of environmental work –sludge, tankers and waste recycling. Business is going well at the moment. Like any business, it has its ups and downs, but generally it’s okay and we’re happy enough. We’re especially proud to be providing employment for 40 local people here in an area where employment is hard to come by. “All of our staff are local, from within a 25-mile radius. We pride ourselves on keeping it as local as we possibly can.”Indeed, the company’s sense of community is epitomised by the remarkable gesture they made to help out their many customers from the local community who found themselves in despair during the fodder crisis of 2013. The business is fronted by four members of the Ward family –Johnie, Petie, Miranda and Delia –all children of founder Peter Snr., who would be extremely proud if he could see the flourishing operation that today operates from his homeplace.